Cylinder L X D: 26 X 1.5 cm/10.24 X 0.59"
Size: Long X Width X Height: 370 X 50 X 235 mm/14.57 X 1.97 X 9.25"
The window opener is an automatic temperature control device. Open the window according to the temperature.Easy to adjust the Open Angle. 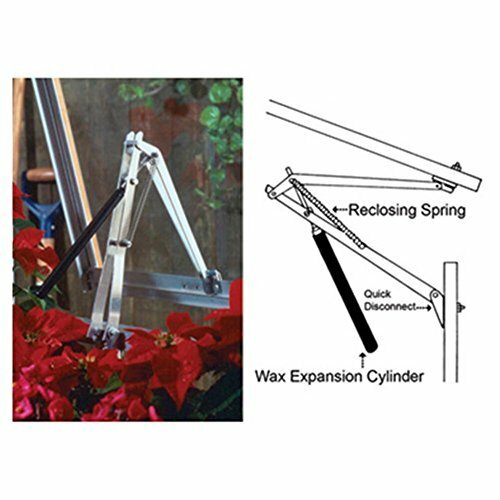 Automatic window opener is suitable for all greenhouse or Furniture Frames. NC contactor responds to the temperature change directly,lead the window open or close. The cylinder reacts to room temperature directly. No batteries or electricity required. Window opener is working at the temperature range about 13 to 34 ℃. Made of aluminum.Easy to install, partial assembly,with spring and installation fittings. If you have any questions about this product by Vktech, contact us by completing and submitting the form below. If you are looking for a specif part number, please include it with your message.